Hardox plate has better dimensional stability and thus sustains a smaller amount of permanent deformation. 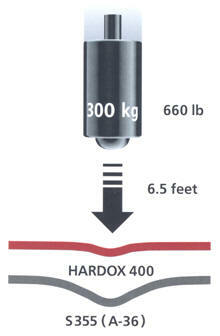 Hardox offers high strength and minimal deformation at high and low temperatures. Due to its high strength, HARDOX plate has better dimensional stability and thus sustains a smaller amount of permanent deformation. Thinner plate can also be used to reduce weight, which then results in a higher payload. The excellent flatness of HARDOX plate is also of great importance in the production of tipper bodies. HARDOX is no ordinary wear plate. Its toughness is very high even under difficult conditions, such as at high rates of strain combined with low temperatures. This makes HARDOX particularly resistant to impact. The properties are the result of an appropriate composition of the steel and an optimized manufacturing process.